Growing up I was a huge fan of Jim Morrison. So I had to visit his grave at the Pere Lachaise Cemetery in Paris. It's possibly the most visited grave in the world. I have finally gotten around to visiting Paris' famous cemetery almost 15 years later and not surprisingly the draw for Jim Morrison is alive and well. 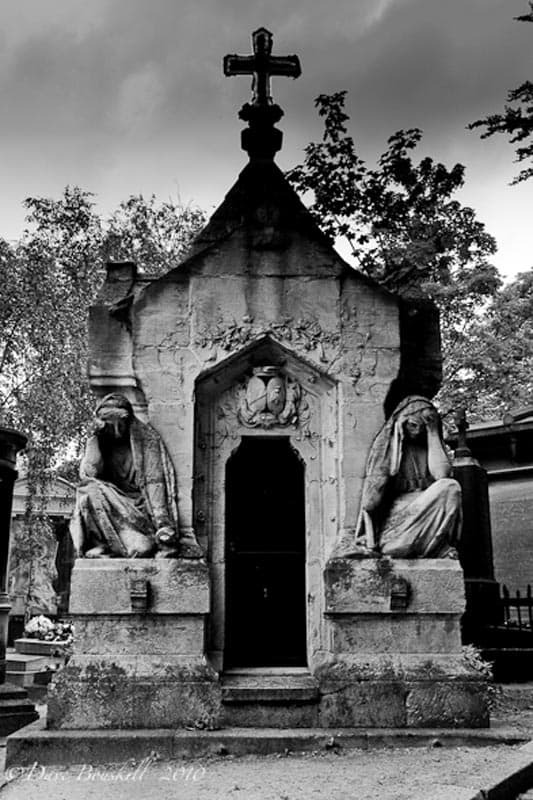 Located in the northeast corner of Paris, the Pere Lachaise Cemetery is the most visited cemetery in the world. Over 800,000 souls are buried here and besides Morrison, there are many other famous residents include Chopin, Moliere, Edith Piaf, Rossini and Oscar Wilde. 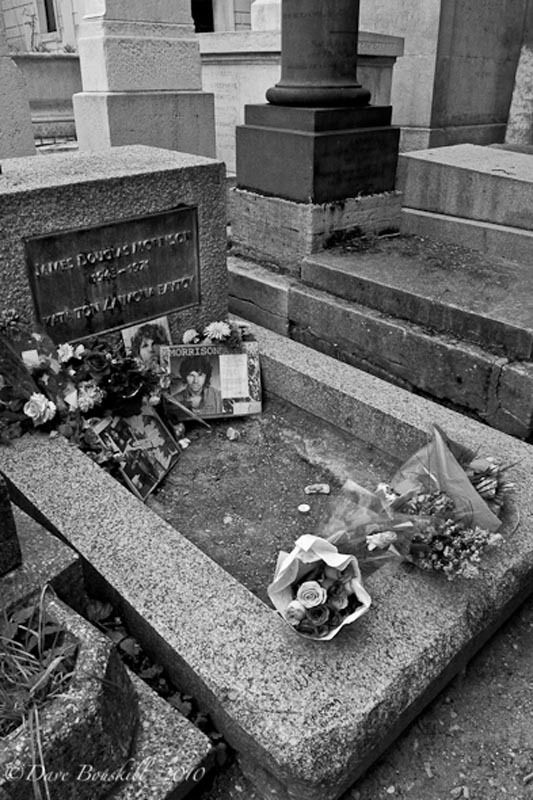 Oscar Wilde's grave is vastly popular at Pere Lachaise. It is covered with pink and red kisses from adoring fans. People have written poems and left love notes and have scratched their names into the already once restored gravestone. Visiting Pere La Chaise is free, but it is much more interesting with a guide Get the Guide offers guided tours for just $9. One can always tell when you happen upon a famous grave by the crowd of people. Walking with our heads buried in our map we would look up to see a crowd and rush to take a look at what famous person is buried there. 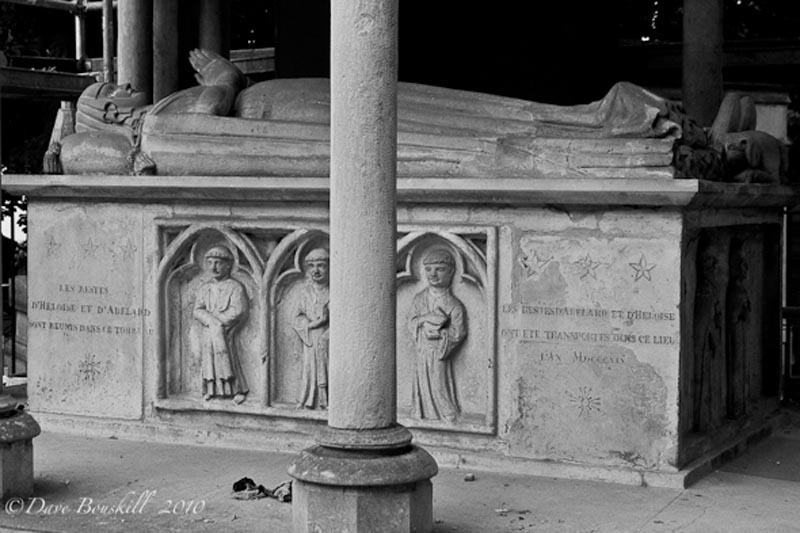 We didn't know the story of the ill-fated lovers Abelard and Heloise, but the crowd drew us to their tomb and we looked into their story to find that their story is tragic and confusing. The day was grey and raining which made for a perfect setting for a visit to the old cemetery. Catch the #2 or #3 metro to the Pere la Chaise subway stop at the east end of the city and you exit right at the cemetery's west corner entrance. There will be a crowd of people examining the large map on display, but don't bother with trying to memorize or write down the numbers of the sections and graves. Instead, walk east to the main entrance at Avenue Principal and pick up your own map to search for the final resting place of your favorite musician, writer or politician. Our first stop like many other people was the grave of Jim Morrison. Everyone in the cemetery was looking for him. Many people didn't know where to get a map and were wandering aimlessly. We would run into them at times and they would ask if we know where to find Jim. Cemetiere Pere Lachaise is one of many Free Things to do in Paris. See our guide for more ideas. 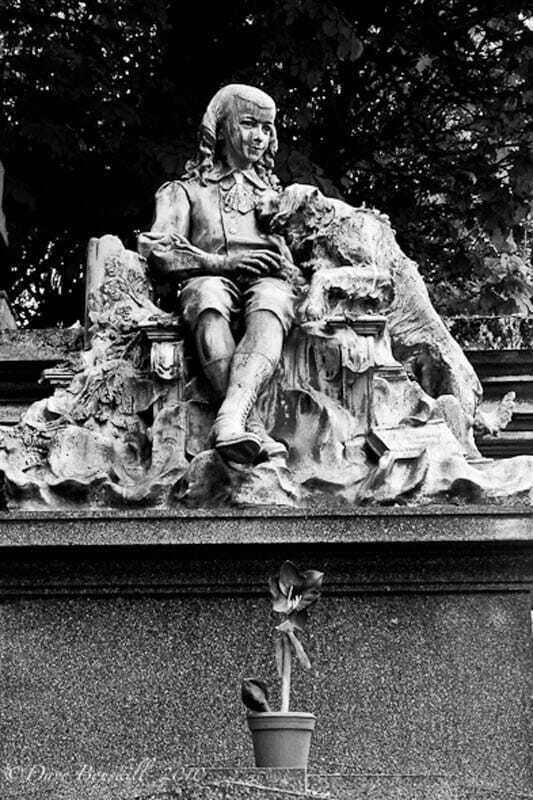 Pere Lachaise is still a functioning cemetery and I couldn't imagine what it must be like for the families that have plots near his and the other famous resident's sites. The headstones near Morrison's grave have endured residual graffiti and the spill off of vandalism all around the famous singers final resting place. 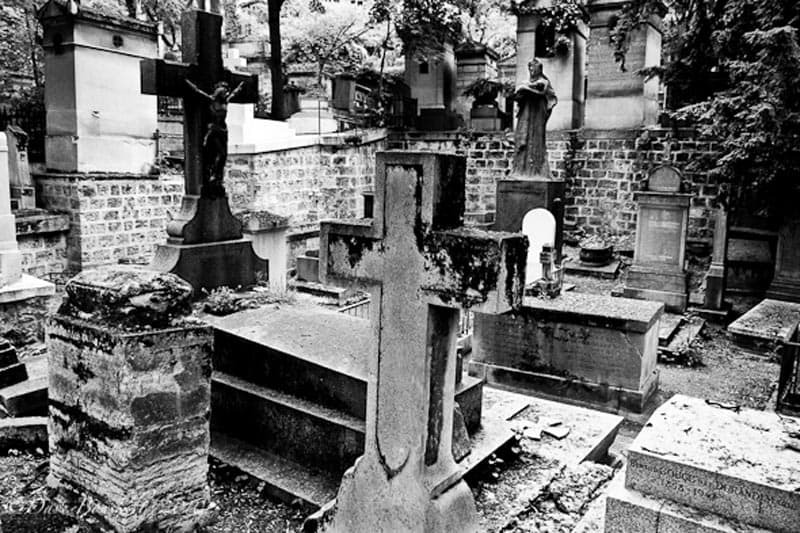 A Great compliment to your Pere Lachaise cemetery tour is a visit to the Catacombs of Paris. The underground maze housing million of human bones on display as works of art. 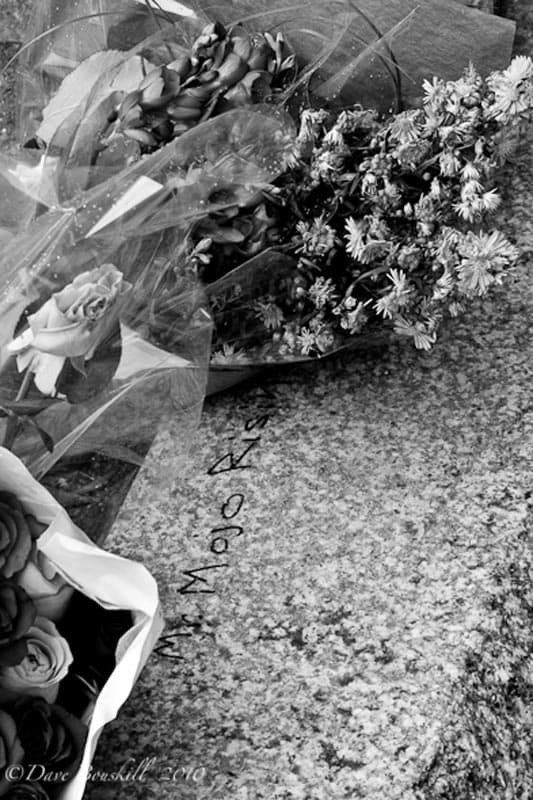 Jim Morrison's grave has become legendary. It looks like it is undergoing major restoration as his bust on top of his headstone is gone. Much of the graffiti on his and the surrounding graves has been cleaned up as well. It looks like they are working to stop this as Jim Morrison's grave is off limits. A fence has been put around it and there is security watching at all times. 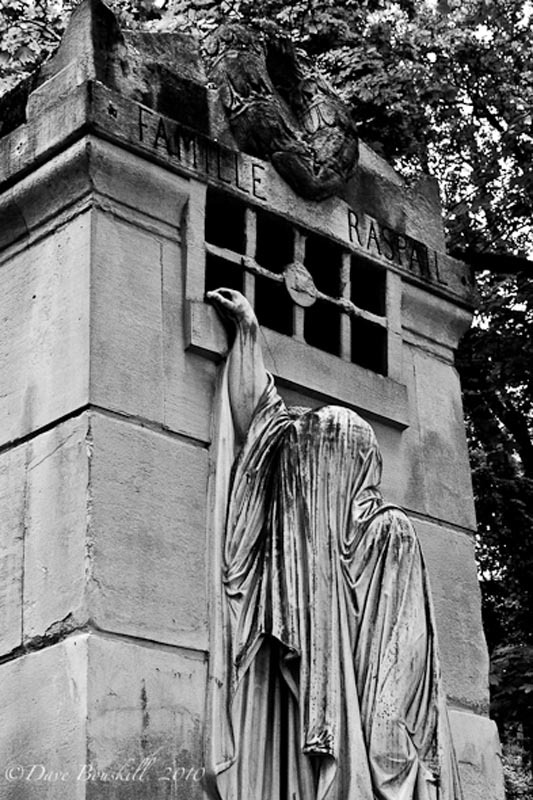 The Cimetiere Pere Lachaise is a fascinating tourist destination in Paris. Giant mausoleums, chapels and even a pagoda loom in every spare piece of land. Massive monuments tower over crumbling tombstones and rotting graves as giant chestnut trees stand guard overhead. For some of the graves, it is obvious that their bloodline has ended and their plots have been left to fall apart. Others are alive and well and are maintaining the sites with flowers and sculptures, they are clearing away the debris and even washing the stones to shine brightly. It is impressive to visit without a map to witness the grandeur and intricate designs of love and despair that have gone into some of the monuments. If you are not interested in the famous residents of Cimetiere Pere la Chaise you can still visit the cemetery and be in awe of the artwork on display at this museum of the dead. Composers, Dukes, and celebrities not only from Paris but from all around the world are buried here alongside normal families are buried here as well. Unknown children, fathers, brothers, and sisters have made Cimetiere Pere Lachaise their doorway to the other world. 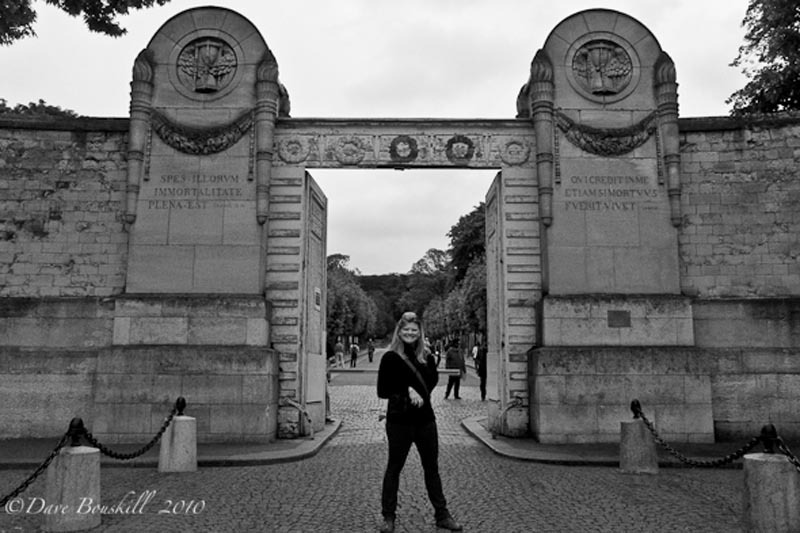 We were brought back to the reality of the sadness that Cimetiere Pere Lachaise holds when we happened upon a funeral taking place on the path where soldiers that have died for France are buried. The sorrow and the misery in the faces of the people reminded us all to respect the dead. Enjoy the artistry and investment that has gone into some of the monuments, but we must stop defacing and ruining a family's final memory of their loved one. 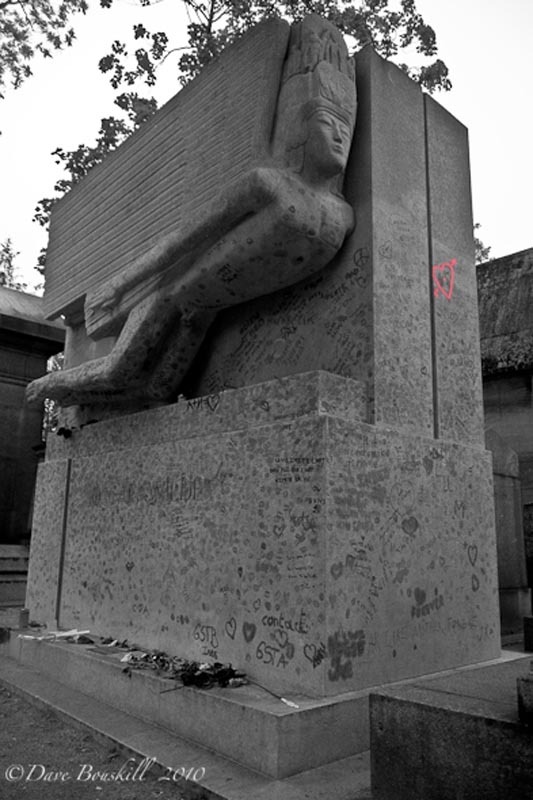 While I thought it was cool when I was 21 to see the graffiti-covered tombstone of Jim Morrison I am happy to see that the Cimetiere Pere Lachaise is doing something to clean up the memory of not only a rock legend but the people around him and the other famous graves of the worlds most popular cemetery. Get the Lonely Planet Paris Travel Guide before you visit this great city. 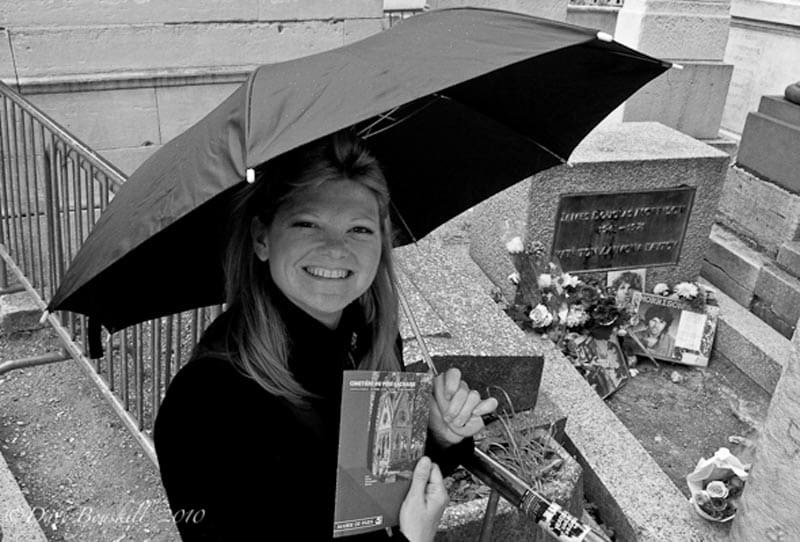 13 Responses to "Famous People Buried in the Pere Lachaise Cemetery of Paris"
What a great bunch of shots. Love the jumble of mausoleums and headstones. So many different levels and features to entertain the eye. Your photos really bring that out. Especially like the contrast afforded by black and white composition. Thanks for the post! .-= Daniel´s last blog ..What We’re Reading: June 11, 2010 =-. Thanks Daniel. Dave had a fabulous time photographing the Cemetery. It is an incredible mixture of crumbling tombstones to impeccable family plots. It is definitely a worthy attraction to visit in Paris. I love the morbid humor found throughout the cemetery, especially the grave with the hands sticking out. As cool as this place was, I don’t have the fondest memories. I’m pretty sure a guy was trying to pickpocket us, as it was an empty day at the cemetery and he followed us around for a while, hands concealed under his coat, drawing so close I could smell his breath, until eventually I just stared him in the eye and didn’t move. Then he darted away. .-= The Jetpacker´s last blog ..Grindhouse Films At The New Beverly Cinema =-. It is true Jetpacker. There are some graves with some great humour. Hey we all die, we might as well have some fun! Too bad you had such a bad experience, that would freak me right out. This reminds me so much of the Cementerio de la Recoleta in Buenos Aires. It has the beautiful statues, the narrow “streets,” and the sad stories. Recoleta’s most famous resident is Eva Perón, and like Morrison, her tomb is always crowded. No graffiti though, just flowers. .-= Jennifer Barry´s last blog ..Live Richly Round-Up #1 =-. To Jetpacker – The man who spooked you,sounds more like a “flasher”, than a pick-pocket. Still, you were very lucky! – It could have been an unfortunate encounter indeed. I’m glad you weren’t alone. A shame that your memory of this stunningly beautiful and melancholy place has been tainted. I particularly like the tomb of Abelard & Heloise – also the graves of Edith Piaf,Sarah Bernhardt, Chopin, Yves Montand….and I always enjoy paying homage to Maria Callas and Isadora Duncan, whose ashes are in the underground “Columbariam”, in Division 87. An awe inspiring place – especially for an artiat and poet, like me. .-= Trisha Miller´s last blog ..Lost Work: A Life Lesson in a Bottle =-.